Last night several of us got together at our new favorite honky tonk place- Marie's Olde Towne Tavern. It definitely qualifies for a "Weird Knoxville" post, if only for the crazy patrons. 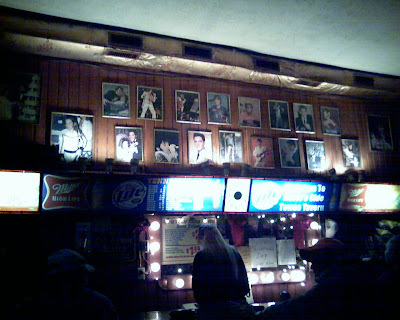 The centerpiece of the place is what I like to call the "Wall 'O Elvis"- a shrine to the life of the the King, complete with his wedding photos. 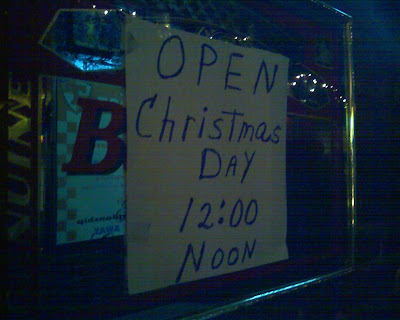 Johnny Cash plays on the jukebox and there's always a darts game going on. And look at the photo below: that's dedication! I read in Metro Pulse that there used to be over 100 saloons and taverns in downtown Knoxville. I could only come up with 21 places in downtown that might qualify nowadays- and Marie's is certainly one of the most authentic.